Planning to buy a Wedding Tent ? Well, no Tent is complete without it’s exclusive furniture. The Low wooden seats and mandap stools are a beautiful asset for a Wedding Tent. 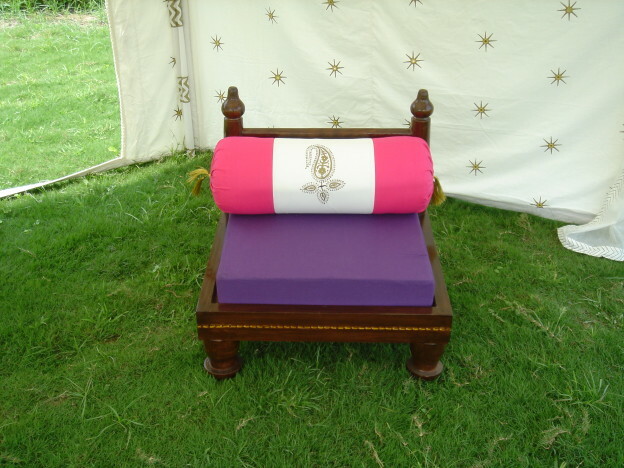 Beautifully hand crafted furniture is manufactured by us, along with foam filled seats and cotton bolsters, to give you a royal seating for your tent. You can order any color seats and bolsters for your low wooden seats, according to your wedding color theme. We make hand crafted stools with velvet and cotton seats to make your wedding mandap look very special and comfortable for you. Our exclusively hand crafted Tent Furniture and hand woven Indian wooden cots are a best seller among clients living in the United States, England and Europe. 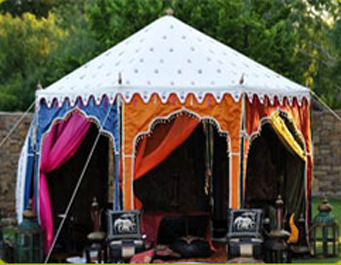 We specialize in all types of tent furniture and wooden cots with cotton mattress. The smaller size of the Wooden cot can be used as a Day Cot in a Resort Tent for the Tent Verandah, lounge or patio. The standard size of the wooden cot can be used to sleep in the Tent or even your home. We make single seater low wooden chairs & seats, for Party Tents and Marquees. The seats are foam filled and light weight, Seats and Bolsters complete the look of the Low Wooden Seats. The metal plated fancy mandap stools, are for Indian Weddings and religious ceremonies, that require sitting on the floor. The wooden stools, woven stools and wooden cots are also additional pieces of furniture used in our Tents. artificial Flower Torans are also used to decorate the tents on weddings and functions. We can also develop your furniture designs on request.